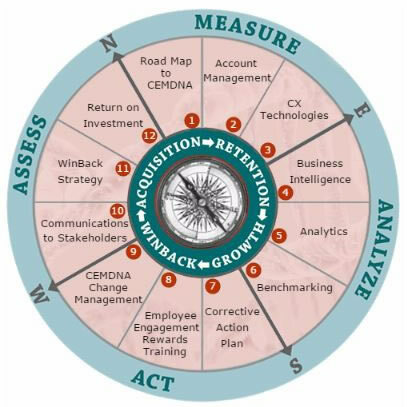 The CEMDNA Playbook Strategy™ outlines 12 key principles and processes associated with developing and implementing successful customer experience strategies. LEARN MORE about each of the 12 components, as well as how to implement this approach at your organization. Also, download our CEMDNA Playbook Strategy Toolkit to learn about the 12 keys to developing and implementing a successful CEM Strategy. Plus, you'll receive sample surveys, reports and briefings. Employee engagement is integral to customer engagement. So, be sure to recognize and reward top performers and top teams for their stellar service. Let CRMI help with our employee recognition and rewards program. Also there’s no better way to demonstrate your commitment to customer centricity than receiving the NorthFace ScoreBoard Award℠ for customer service excellence. There are so many CX technology and services options available that it can be a challenge to find the ones that are best for your needs. The CX Lab will provide to access exclusive software and app trials with our vendor partners, as well as exclusive pilots and trials from our services partners, such as consultancies, training companies, and survey firms. Membership to CRMI includes our monthly CX Strategy Playbook Review Newsletter, which links to our latest content, provides updates on upcoming online and live events, and more. Visit the newsletter archive for a preview. Refer a Corporate Member and get rewarded. Once your referred prospective member becomes a Corporate Member, you'll receive $500 Amazon gift card as our thank-you for the referral.